Protect against insects, weeds and plant diseases with this Commercial Tank Type Sprayer. 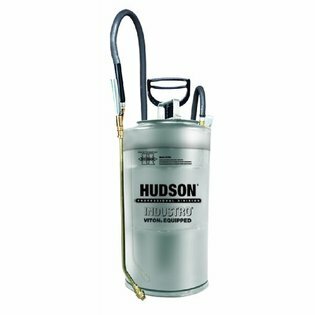 The 2 gallon stainless steel tank sprayer is high quality and made in the USA. It has a Kem-Oil braided power sprayer-style hose, which is chemical resistant. The sprayer has a Brass Thrust less control valve which shuts off quickly. In addition, it comes equipped with a 6" inline 40 mesh filter and a strong brass 24" spray wand. It also has a 10" brass pump - great for high temperature and many solvent applications.